The standard way of holding the violin is with the left side of the jaw resting on the chinrest of the violin, and supported by the left shoulder, often assisted by a shoulder rest or a sponge and an elastic band for younger players who struggle with shoulder rests. This practice varies in some cultures. When standing, stand straight with feet shoulder width apart, and with relaxed knees. Some violinists recommend sliding the left foot slightly forward. When seated, use a chair with a firm base, and sit up straight (soft sofas aren’t recommended). Some violinists sit towards the front of the chair, and prefer placing the left foot slightly forward. 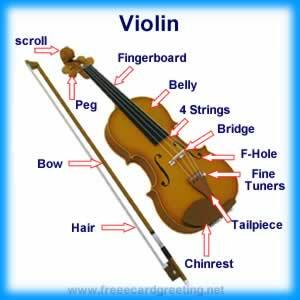 The elbow should be under the center of the violin. Keep the wrist gently rounded.Avoid resting the wrist against the violin neck.The thumb should be opposite the first or second finger.Maintain a curved, open space between the thumb and index finger (a backwards "C"). Bow Hold Tips: Relax hand, slightly turn wrist to the left, and let the fingers drop into place.The tip of the bent thumb touches the frog contact point.Fingers gently curve over the top of the bow stick.